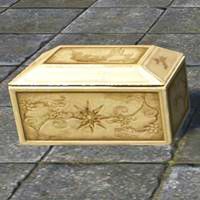 Scrimshaw Jewelry Box, Floral is a housing decoration made by Jewelry Crafter in The Elder Scrolls Online. "This is a small house item"
Crafted, Jewelry Crafting Station. Requires Sketch: Scrimshaw Jewelry Box, Floral. Sketches are found randomly in containers around tamriel, and can be traded and sold by players. Some special sketches are only availble from pickpocketing or as special rewards.